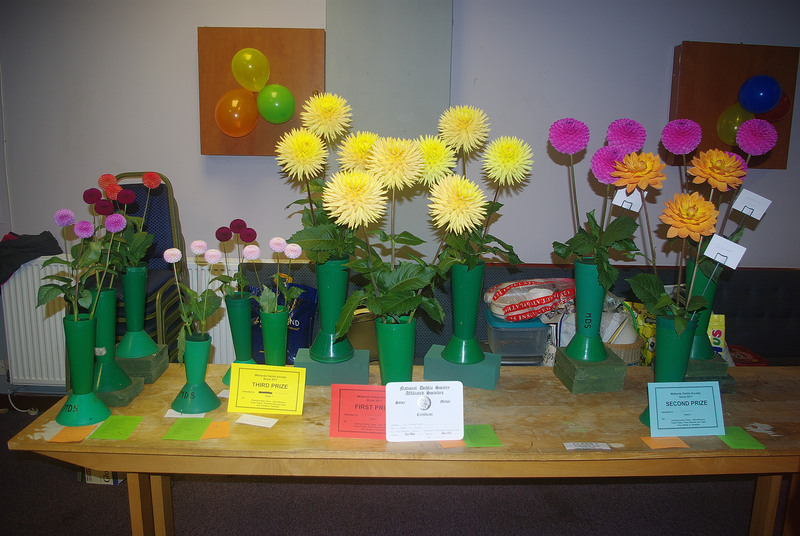 The final society show of the year was very well attended 20 exhibitors staged blooms, and there was a surprise for a couple of nongenarians! Society Chairman, Rob Cheetham wins the Championship class and the NDS Silver medal for best in show; Peter Clubb won Second Best in Show. Rob receives his Medal from Society President Ron Guest. Championship class entries - click in centre of picture to see it in details. Fred and Les get birthday surprises! Fred & Les receive their 2018 Dahlia calendars in recognition of their long service to the society and as belated birthday presents. A birthday cake was provided by Bruce and sandwiches provided by Sarah and Rachel. It was a good time and will be remembered for some time. Christine Cottingham won the Large / Giant class in the Novice section with Paul Bugden second. Brian Carter won the Medium Cactus class with Hillcrest Candy. Clive Toll won the Novice medium cactus class with Hillcrest Candy. Dan Boulstridge wins miniature ball class with Mary's Jomanda.